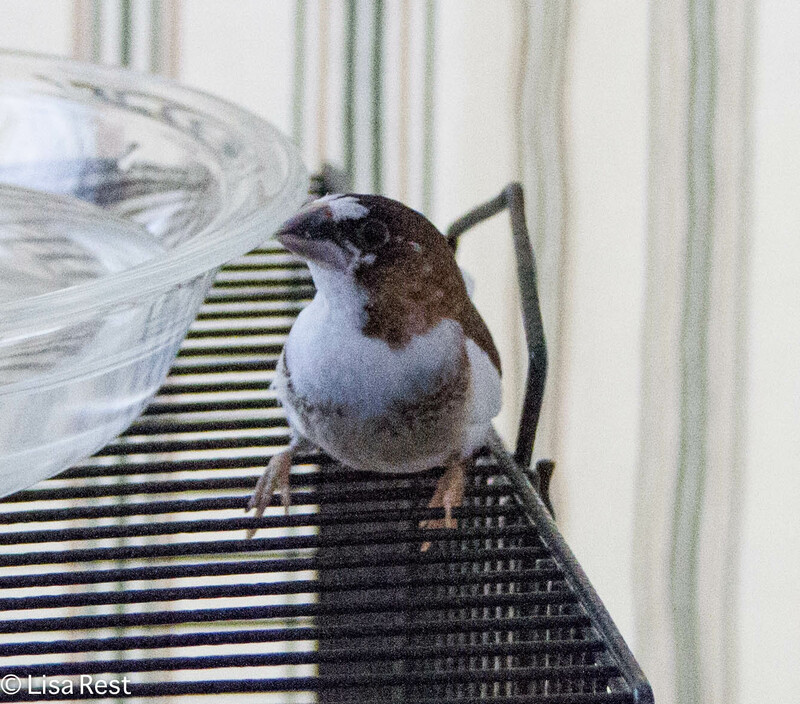 After two weeks of observing a very bored and resigned Isabella, I broke down and introduced three new Society Finches into the home bird mix this weekend. Let me back up and say goodbye to Ferdinand, her former companion. He was still singing but a mess, unable to fly and down to his last feathers, before I left on my trip in November, so it was no big surprise to find out he had succumbed while I was gone. I knew I would miss his singing, for sure. But not missing having to cart him around every time I had to clean the cages, because he could not fly, not to mention his miserable self. If I took any pictures of him in his reduced condition I am not interested in finding them. I started writing this post weeks ago, and now the Societies have moved in. Indeed for a while there it appeared they were taking over. 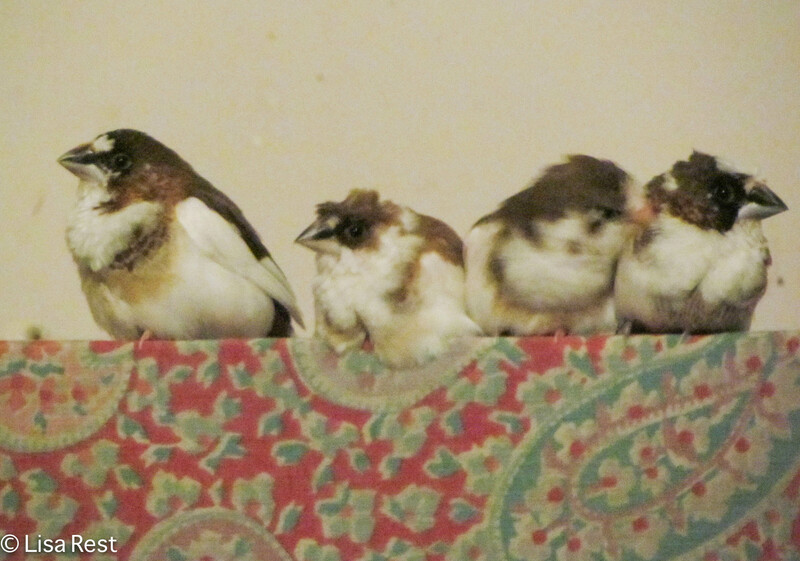 They are recognizable by variations in appearance, and so I have named them Hector, who is a scruffy little pale male with a punk hairdo, Phoenix who is the darker one more resembling Isabella but not quite, and Rikki, who has a pink bill and a very loud call. 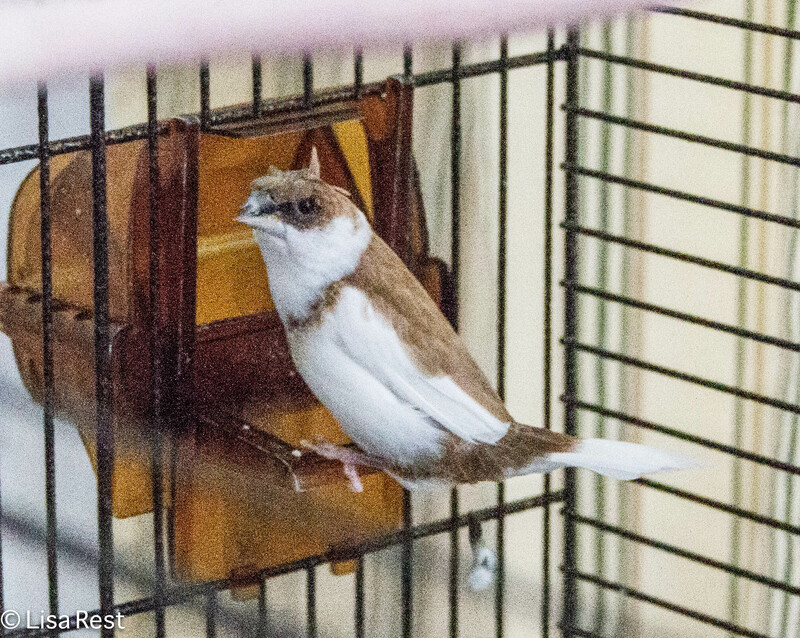 I bought three birds to practically insure I would get a male and have his song to compare to Ferdinand’s. 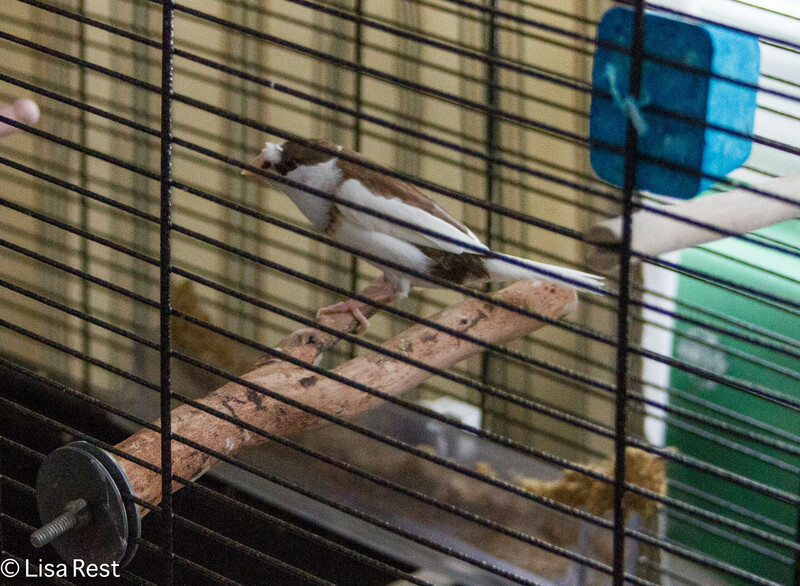 There were about 16 birds or so in a tiny cage at PetSmart so it was a crap shoot which ones I would get when the young attendant opened the cage door from behind and started waving around his net. Hector is quite lighter than the others and he was smaller, so I wasn’t sure I wanted him, but now I’m glad he came, he’s definitely a character. His song is quite different from Ferdinand’s. My first impression of his song was a little like a Winter Wren trying to sing Papageno’s “Magic Flute” song. Click on the clip below to hear him (apologies for the shaky background music). After I’d had them a couple days, in a moment of weakness I decided to buy some nest boxes and put them around. The two bamboo ones have hooks on the back so they were made to stick in the cage. The other thatch nests I hung around but there is only one left after the budgies started chewing holes in them, and it belongs to Zorro and Fiona, in the same spot as their forever failing curtain nest but now replacing it. 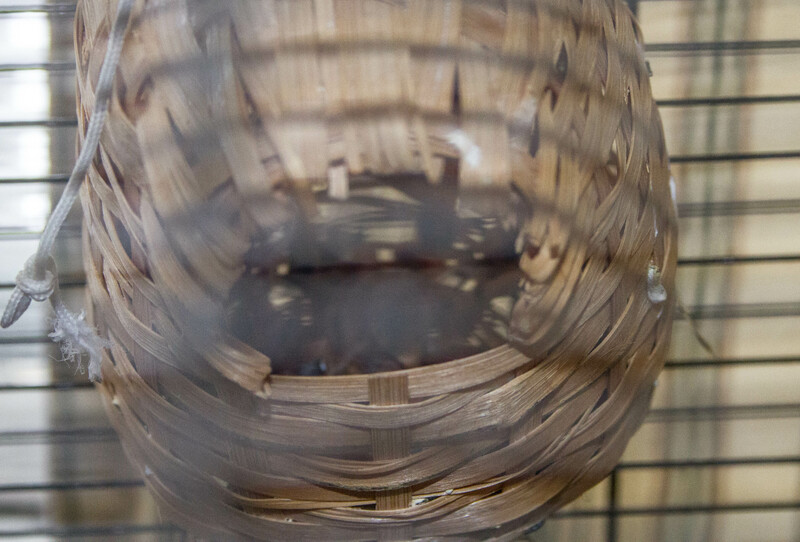 The bamboo nests are in one finch cage and initially had 10 or so eggs between them. The three new Societies have been taking turns sitting on them. Three weeks ago I had no idea whether the eggs were fertilized but they seemed to think so. And just about when I had given up hope, I began to hear little begging noises. 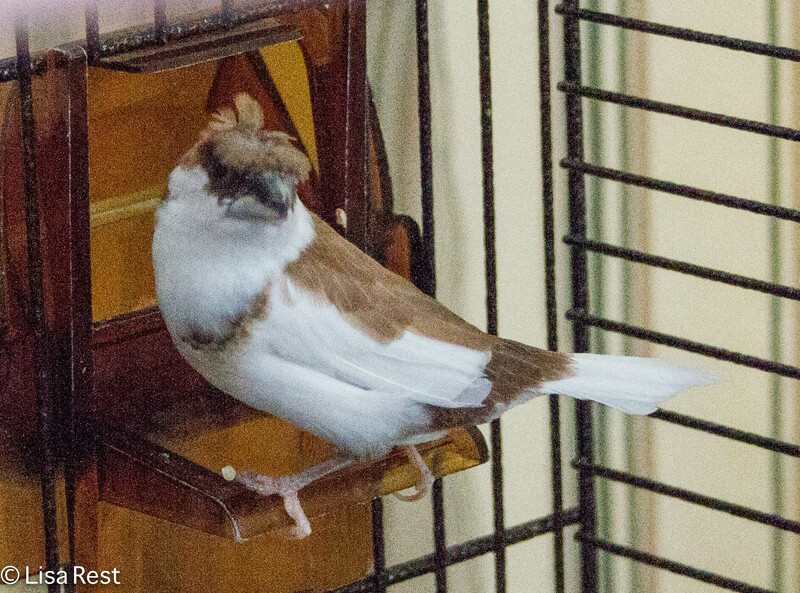 I haven’t had birds breeding in the house for years, so this is kind of a nice diversion. I’m always up for hearing begging sounds in key with the music and new songs developing among young males. If I do get a couple males it will be interesting to see whether their songs imitate Hector’s or if they branch out on their own like my Zebra Finches tended to do when they were going at it. But I will be removing the nest boxes after fledging because I do not want to continue this experiment ad infinitum. Inbreeding is not my calling and it shouldn’t be theirs either. Society Finches don’t use a lot of nesting material like Zebra Finches so it’s practically impossible to resist looking inside when one nest doesn’t have anyone sitting on it. Last night when I was cleaning, I saw one, possibly two, pink eraser-like blobs moving in the leftmost nest. 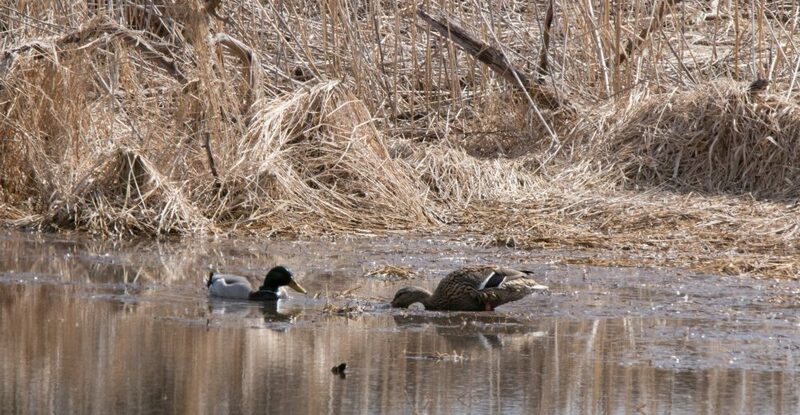 This morning I seemed to be able to see two or three with some feathers in the righthand nest. I tried to take a picture but it’s impossible to get anything between the cage rungs and the darkness inside. Not to mention it’s always a challenge to get pictures indoors anyway, with the cages backlit against the living room windows. If nothing else Hector and his Society Matrons have livened up the place and all the other birds have grown used to them. I hope to have baby pictures soon. In the meantime here’s another picture of Hector. This entry was posted in Bengal Finches, bird love, birds, birds and music, photography, Society Finches and tagged baby birds, breeding birds, fledglings, hatchlings, Mozart, nest boxes, nestlings, Papageno, Society Finch song, The Magic Flute, Winter Wren by Lisa Rest. Bookmark the permalink. I meant to get caught up with the latest opinion on Society Finches a/k/a Bengal Finches. Apparently they have been domesticated in China and Japan for a long time. So much so that they seem to have forgotten a lot of their wild history. But when I looked up finches to see if I could figure out which one they resembled most, it seemed to be the White-Rumped Mannikin and now I have just read on someone’s website that they are considered the domesticated form of this bird. So I’ll go with that for now.